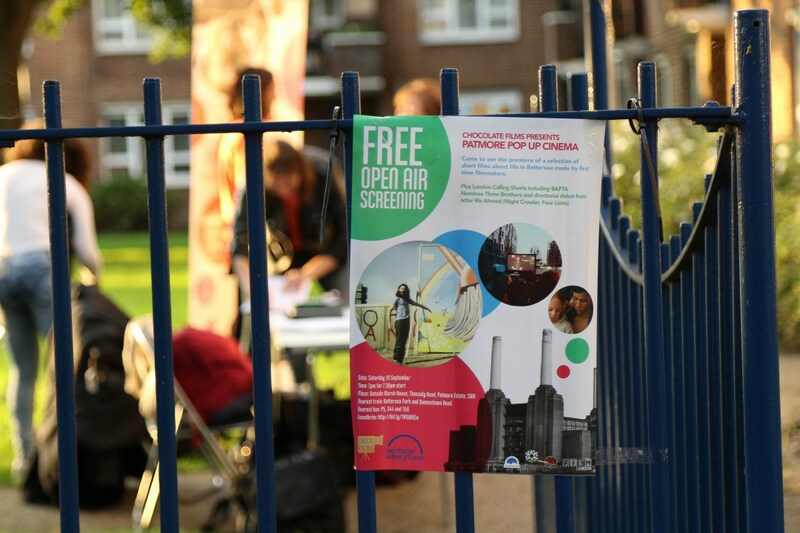 On Saturday 19th September 2015 four films made by local young people will be premiered at a special outdoor cinema screening on the Patmore Estate, Nine Elms. Each of the films were devised, shot and edited by participants from Chocolate Films’ Project Nine Elms Past and Present during two week-long workshops earlier this year. Alongside the Nine Elms Past and Present programme we will be screening films from Film London’s, London Calling programme including directorial debut from Riz Ahmed (Four Lions and Night Crawler). The event is free to attend and all welcome but we would like people to let us know they are comming by registering here. The pop up cinema is presented by Chocolate Films in partnership with Wandsworth Council, Nine Elms on the Southbank and The Lost Picture Show supported by the National Lottery through the Heritage Lottery Fund. Please note: If it rains the screening will be held at the Rose Community Centre Ascalon Street, Savona Estate, SW8 4DJ.